No artificial flavouring, Colouring, preservatives added. Ideal for salads, marinades and recipes. Sediment may be present, but it does not affect quality. 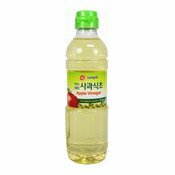 Ingredients: Concentrated Apple Juice, Spirits, Glucose, Water. Simply enter your details below and we will send you an e-mail when “Apple Vinegar (蘋果醋)” is back in stock!